A comprehensive and flexible multi-format video switcher giving you complete control of video sources, key layers and mixing engine configurations. The V-1200HD introduces a unique flexible hybrid engine with 4:2:2 broadcast switcher and 4:4:4 live event switcher. 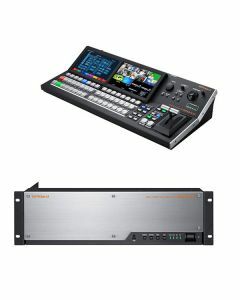 In addition to powerful video capabilities, the V-1200HD also has a built-in 16-channel audio mixer. Also includes V-1200HDR Control Surface.